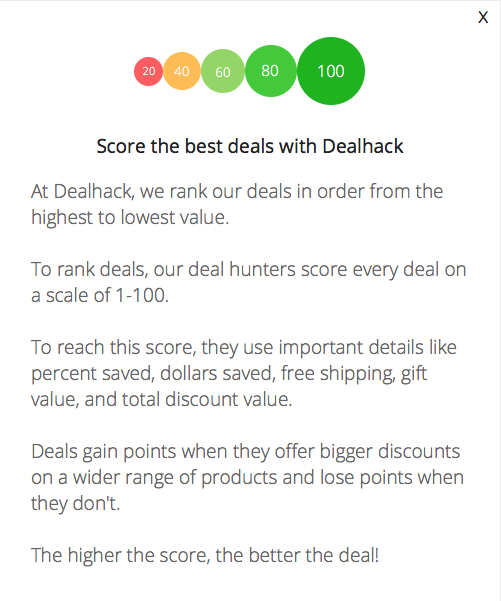 Dealhack is on a mission to find you the best discounts for your favorite online retailers. Visit HerbsPro to find everything you need to keep your body running in tip-top shape. You can find herbal supplements and weight loss remedies on their site. Plus, you can also find items for digestive and blood sugar support. Even find products to help you quit smoking at HerbPro. HerbsPro offers around 30,000 different products. On their site, you'll find bath accessories, baby care products, and children's vitamins. You can also find cosmetics, home & garden supplies, and sports nutrition products. HerbsPro also offers wholesale products for low prices. Browse through the helpful wellness library for in-depth information on health conditions and supplements. You can even learn more about living a healthier life with wellness tips. Furthermore, find healthy recipes, health improvement tools, and alternative medicine options. HerbsPro carries some of the most well-known brands in the supplement industry. On their website, you'll find great products from over 1,000 brands. Browse industry leaders including Nature's Way, Born Free Baby Products, and Country Life. Jarrow Formulas, Doctor's Best, Newman's Own, and American Biosciences just to name a few. The team here at Dealhack is always on the lookout for the best HerbsPro coupon codes and new ways to save. You can save by visiting the best deals section on their site. You can also visit their homepage to view great offers. We have a better idea. Grab our top ranked coupon code and save on your order today. You might have to meet a minimum spend requirement for the coupon to work. Just copy the code from this page and apply it at checkout. HerbsPro has thousands of fans on social media. Follow them on Facebook, Twitter, Pinterest, and Google+. You'll never miss another opportunity to save. Contact customer service by calling 1-866-915-5300 or connect via their contact page. Visit the HerbsPro homepage to find great offers. You can view the brand of the month or usually find sitewide offers. Receive a shipping credit of $4.95 on orders that weigh more than three pounds and cost less than $79. Check out the clearance page to see what’s on sale today. You can save up to 75% compared to regular prices in the clearance section. It may not seem like much, but free shipping is another way to save. Purchase in bulk or with friends or family members to meet the $79 requirement for free shipping. What is Today’s Best HerbsPro Promo Code? The best HerbsPro promo code right now is SNM19. This code is for 'Up to 63% off Sunmark Plus Additional 5% off'. Copy it and enter it on the HerbsPro checkout page to use it. HerbsPro offers free shipping on orders that total $79 or more and weigh less than 3 pounds. HerbsPro offers a 30 day “no questions asked” return policy. To return your order, contact customer service and they will send you a prepaid return slip in the mail.